For thirty years, President Hosni Mubarak had ruled Egypt by manipulating elections, crushing dissent, and jailing and torturing his opponents. On January 25, 2011, they came into the streets, calling for the downfall of the regime. Protests in Cairo’s Tahrir Square spread to all of Egypt. In eighteen days, Mubarak’s police killed almost a thousand demonstrators, but failed to stop the uprising. Mubarak was out. What seemed a surprise had been building for at least a decade: workers had been striking, human rights groups had gone to the courts, and a brave new generation had taken to the streets. At the start, revolutionary goals seemed possible: bread, freedom, dignity. Interim military rulers promised a transition to democracy. But the revolutionaries were fragmented, lacked leadership, and had no clear vision. The spirit of the revolution dissolved as elections produced a parliament and president controlled by the Muslim Brotherhood, and then a return to military rule. 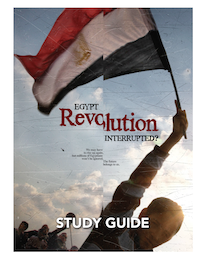 Download this Study Guide (PDF) for additional information about Egypt, including historical background, maps, details on the 2011 uprising, and the role played by nonviolent civil resistance in the revolution. Suggested discussion questions are included, as well as a bibliography and links to online resources. You can find more educational resources on civil resistance in English, Arabic, and over 65 other languages in our Resource Library. Many of these resources are downloadable.